Unlike many of the female drivers who raced at the top level before her, Giovanna Amati probably owed her opportunities to the fact she was a woman. While she raced regularly in Formula Three, winning on race in 1986, her record was every average and there were more than a few surprised faces when she was invited to drive for Brabham at the start of the 1992 season. With the team on the verge of collapse, it was seen as a move to attract sponsors more than anything else. In fairness to her, the Brabham was a poor car, in terms of build and a lack of testing, and she failed to qualify in three attempts at Kyalami, Mexico City and Interlagos. It was indicative that when she made way for a young Damon Hill - again a financial decision as the hoped-for sponsors had not materialised - he too failed to qualify six times out of eight. 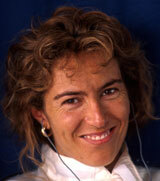 Amati continued to race, and in 1999 finished third in the SportsRacing World Cup SR2 class championship, She also moved into journalism and TV commentary. Aside from being the last woman to participate in F1, she has another claim to fame. As a child she was kidnapped by gangsters in an attempt to extract a ransom out of her wealthy parents.